Over two and a half months ago, Subdeacon Nectarios Yangson was rushed to the emergency room several times in the span of two days with an incredibly high sugar count of 651, the root cause being a negative physical reaction to a steroid medication prescribed to him after his two-month-long bout with pneumonia. Brother Nectarios was dangerously close to falling into a diabetic coma, and the ER staff worked tirelessly to bring his sugars down. His ER doctor, amazingly, was a Russian Orthodox Christian, a rarity in the Hawaiian Islands. Brother Nectarios contracted pneumonia in both lungs while traveling for two months with the Mother of God throughout the United States and Canada in October and November of 2018. Refusing to end his pilgrimage with the Mother of God, he endured and returned home to the Islands very ill. Unfortunately, Brother Nectarios, who at the time of his medical emergency was not considered diabetic, lost all vision in his left eye and began losing the sight in his right eye. This loss of vision was particularly difficult for Subdeacon Nectarios, as it affected his ability to function; he said the most difficult was his inability to serve on kliros, and to read the names and prayers of the thousands of faithful who ask him to pray before the wonderworking Iveron Icon. Brother Nectarios serves as the Protopsaltis at the Iveron Mother of God Mission Parish in Honolulu, HI, a ministry he has performed for nearly 25 years, since the age of 15. 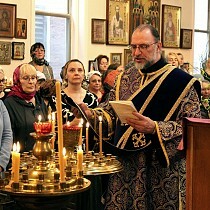 Many thousands upon thousands of people throughout the world have been praying for dear Brother Nectarios, including on Mount Athos, in Jerusalem, at the Holy Kiev Caves Lavra, at Pochaev Lavra, and all throughout Russia, Georgia, Romania, Greece, the USA, Canada, and the rest of the world. This is testament to the faithful service and love that he has shown to the Mother of God and the love he has for the thousands of people he faithfully serves with his service to the Mother of God. The faithful love him for his genuine Christian kindness, generosity, and compassion, virtues rare during these turbulent times. After weeks and weeks of prayer for dear Nectarios, we can report a miracle has occurred. After receiving a blessing from his spiritual father, he has agreed to allow us to share what has happened to him. After speaking with my spiritual father in Greece, I will relate the following, with his blessing. I lost my sight following a diabetic attack in January. I didn’t let on to too many people how severe it was. Only my wife, spiritual father, parish rector, and a few others knew of my deep struggle. I have been having much difficulty with my vision. I cannot relate how difficult it has been for me. I struggle in performing basic functions. As I returned to my secular job in a limited capacity, I had a great deal of difficulty functioning properly and performing basic tasks. Serving on kliros was also something I could no longer perform. I had to rely on others, who stepped up incredibly to help chant and lead the services from the kliros. This was painful for me. But the most difficult was that I could no longer easily read the names of the people who asked me to pray for them before the Mother of God, something I have done each day at 3:00 AM these past, going on, twelve years. The diabetic eye doctor informed me that laser surgeries, optical injections, and other procedures might alleviate the blurriness, reverse the blindness, or alternatively completely exacerbate the situation. The unknown is what scared me the most. But, as I conversed with my archbishop, his gentle reassurance and kindness, along with the prayers of many of the faithful throughout the world gave me hope. The thousands of e-mails and texts and phone calls gave me strength, an active reminder of the "one thing needful," to quote Scripture. Whatever my struggle is… Glory to God. God is good and the Mother of God has been gracious to me, unworthy though I be. I am blessed. I realize God allowed me to undergo this trial for the betterment of my soul and to strengthen my connection with His divine grace. God is good. Whatever happens, that is all that matters in life. [T]he evening of February 24th was a particularly difficult time for me. My vision… fluctuates so severely it oftentimes causes me painful migraines. I’m not a fan of taking medications, but it does help at times. We had a wedding that night and my eyes were having difficulty focusing, utilizing my new pair of "high-power" reading glasses. Coke bottles, as my koum jokingly tells me. It was fatiguing, especially as I struggled to read the Epistle for the first time in church in a long while. I love serving the Lord in church and in my podvig to the Mother of God. It pains me not to be able to do it at this time. As my wife drove home, I began seeing flashes of light and floating objects in my eyes. My left eye was completely blurred as usual and my right eye began seeing stars. Dizzying to say the least. But again, God is good. That night I went to bed and slept throughout the night. I am hesitant to say what occurred, but my spiritual father says "I must tell everything that transpired." I had a dream I was sitting in a room reading a book, and to my right was a young Maiden sitting with me, smiling, with her hands folded on her lap. It was the Mother of God. I looked at her and she smiled, I could feel my face also smiling. Complete and utter peace. And then I woke up. That was it. Nothing more, nothing less. Only peace. I instinctively reached over to my phone on its charger to see the time. It was early. I then realized I didn’t have my glasses on, at that point I reached for them knowing I couldn’t see anything without them. And then I came to the realization that something was different, I could see, everything… without them. In a state of shock, I grabbed my Bible and opened it up and could clearly see the passage before my eyes, which was II Corinthians 5:7, "for we walk by faith, not by sight." Divine providence that I happened to open the Holy Bible to that particular passage. I got up, ran to the private chapel where the Holy Iveron Icon is kept, we don’t have a public shrine for her yet. I looked upon the face of the Mother of God. Peace. Just… peace. I returned home and checked my blood sugar, it was normal. The first time under a hundred in two months. I began reading my morning prayers and read names of the faithful. Not sure how long. When my wife came home, we went out and I literally drove her crazy by reading all the names and numbers off license plates, street signs, and storefronts. She was overjoyed that my sight was restored. And that she no longer had to drive me everywhere, I’m kidding. 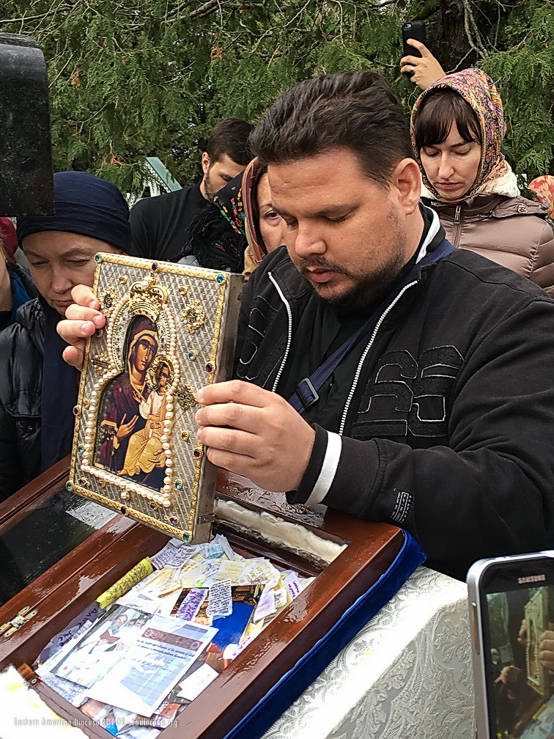 I realized something else, it was February 25 (February 12 by the old calendar), the feast day of the Mother of God, in honor of her Wonderworking Iveron Icon in Moscow. God is good, and the Mother of God has been gracious to me, unworthy though I be. I returned to the diabetic eye doctor later that week and as she put it, "I can’t explain it, but there is no sign of diabetes in your eyes." A "miracle," she says with my high A1C numbers. My vision is also once again 20/20 in both eyes. I still struggle with my new life as a diabetic, though I no longer inject massive amounts of insulin, I am now keenly aware of the damages done to my body by sugar, over-processed starches, and high-fructose corn syrup, among other things. Moderation is key to life in every aspect. We all know this to be true, but life emergencies bring this truth to the forefront. 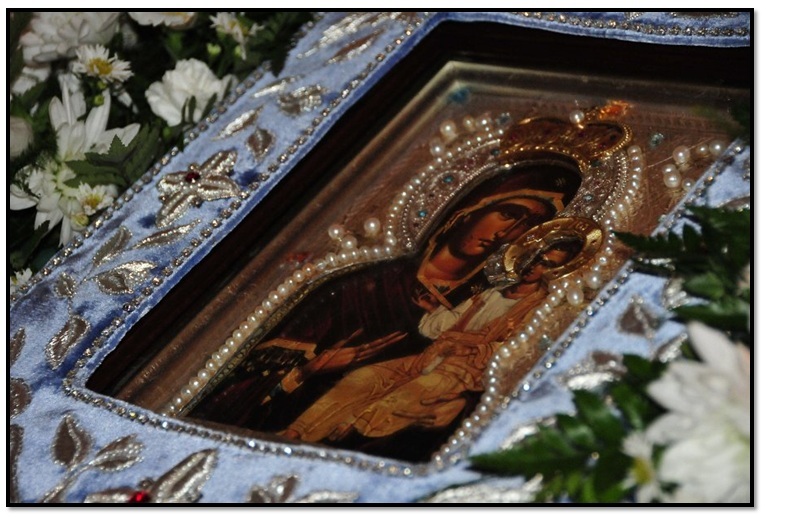 I received my sight back to me on the feast day of the Mother of God in her Iveron Icon. Was this a miracle? I believe it was. Perhaps it was simply my blood sugars normalized and my body restoring my vision, the diabetes no longer present in my eyes is a little more difficult to explain away. But again, God is good. I’m not sure what else to say, but maybe this… our struggles, whether they be physical, medical, mental, even financial, whatever they may be, should bring us closer to God, not separate us from Him. The Holy Fathers teach us that life is filled with struggles and pain, and it is not a punishment, but a blessing, a gift that is meant to direct us to our Lord Jesus Christ, Who is our chief example in life. He was led as a sheep to the slaughter in order for us to once again embrace and be embraced by our Heavenly Father. Christ suffered for us, died on the Cross, and resurrected for us, established the Church for us… Why would God suffer for us and then forget us? It’s illogical. Even now, whatever today’s difficulty may be, it is a teachable moment on the building of our "Christian character" (the cleansing of our souls, the exercise in the transformation of our souls and bodies in Christ, the Greek Holy Fathers call this "ascesis"). Do we react with negativity and anger and despair? Or do we accept these struggles for what they are, and have the faith that our Lord Jesus Christ will save us in the end. 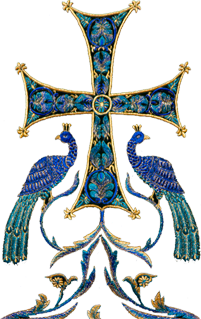 We are blessed as Orthodox Christians to have something so precious that few others in the world have, and that is truth. May we never reject what we have, may we never waiver in our truth, may we preserve it unconditionally for those that come after us. May the Most-holy Mother of God watch over us all and keep us safe under her sacred Omophorion.